Slides are popular climbing frames accessories as children of all ages like them. 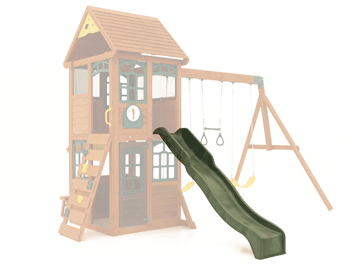 Our range of play equipment with slides comes in a selection of sizes, shapes and styles to suit kids of all ages, and gardens of all sizes! Our straight wave slides are heaps of fun and completely safe, with dual reinforcement. They are tough enough for kids to slide down, and climb back up. Our straight slides feature high rails making a safe entry point, and they have flattened bottoms to help them land safely on their feet. They offer a fun fully enclosed ride of 3.65m (12ft) and take up the least amount of space of any of our slide types. They turn in on themselves rather than sticking out to the front or side of the play set. It flattens at the bottom so children land on their feet and can soon be on their ready to go again. 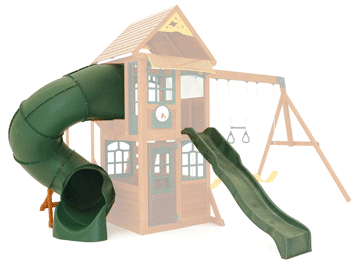 Double the fun, combo play centres offer double slides, which could be two straight slides, or a straight and a tube slide. 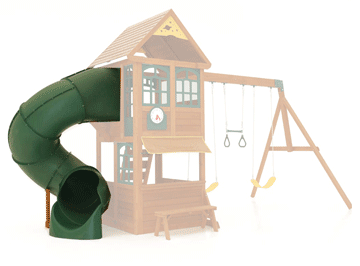 This enables multiple children to play at once, and provides more variation as they can race or take turns on each slide.